If you were stranded on a desert island which ONE book could you not live without? I literally just wrote a post about books I'd take to a desert island and I had it down to 10 books and 3 rather large series and felt like I had achieved the impossible. Now you want me to take that down to one??? I'm going to say a short story collection by Agatha Christie - I'm thinking Three Blind Mice and Other Stories. Her short stories are so great and have such a range of subjects that I think that would keep me entertained for awhile. 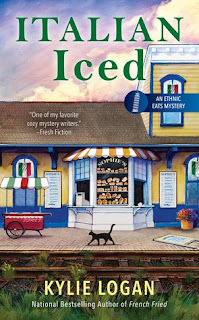 This week's book is Italian Iced by Kylie Logan. Logan is a cozy author I've been wanting to read for awhile and this series focusing on different world cuisines really intrigues me. I have the first two but haven't read them yet but so far it's working pretty well to be jumping in with the 3rd! The sound didn't make any sense. The narrator is waking up when she's thinking this and I can really identify with that thought! I wrapped my arms around myself. "I don't think I like the thought of people talking about me. And I'm sure I don't like the thought of some creepy guy asking where I live and one of our neighbors telling him." I'm pretty sure I wouldn't like either of those things either! So what do you think? Keep reading? What one book would you take to a desert island? I've been reading lots of cozies lately but haven't come across this author yet. It sounds like a good story. 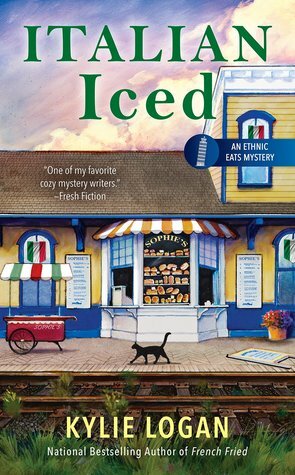 This week I am spotlighting Shelved Under Murder by Victoria Gilbert. Happy reading! Went over to your "Ten Books for a Desert Island" post because I really liked your Agatha Christie choice. Originally I would have picked an old favorite like that, but after seeing you went for books you want to read, now I'm not sure. Since I liked both the Laurie King Books and the Mrs. Pollifax series, maybe I'd go with the Deborah Crombie series. Thanks for the recommendations. Oh I don't think I could just pick one book! Happy reading! I've been interested in this series, so I'll be watching for your thoughts on this one. Another intriguing and tempting cozy. Thanks for sharing...and for visiting my blog. I'd be freaked out if that 56 happened to me! Happy weekend! 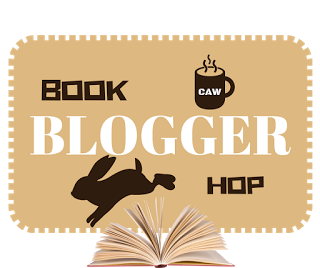 LOL on your Blog Hop answer. It is difficult to narrow down to ONE. Looks like a cute mystery! Oooh! I really need to read some Agatha Christie books! Great answer! A short story collection would be a good way to get a nice mix of tales. Yes, that 56 almost gave me chills. Don't like how readily other people are at giving people's personal info out. Hope you enjoy your weekend! Sounds like a good cozy!!! That is almost like the what is your favorite book question. How can you pick just one! Impossible :) I haven't read Kylie Logan before but this book sounds great. I hope you enjoy it!